Diving in Komodo is the most popular activity chosen by those who venture to visit this part of Indonesia. No wonder, since the waters of the national park have incredible biodiversity seen in few places on the planet. Therefore, the Komodo National Park dive sites are a mandatory stop for scuba diving lovers and for adventurers who want to try it for the first time. Many of the dive sites in Komodo give you the sense of submerging into a giant fish tank where the density of marine population is exorbitant. Manta rays, sharks, napoleons, barracudas, mackerels, lionfish, cuttlefish, frogfish, sea horses, turtles, nudibranchs, harlequin prawns, and orangutan crab (just to name a few), will never cease to delight. Each dive is guaranteed to be unique. Plus, the health of the corals and their colors will keep you hooked during the duration of your dive. The Komodo National Park dive sites can vary greatly due to the strong currents of the area. Before getting your heart set on a dive spot consult with your Dive Shop about the conditions and your experience as a diver. We could separate the park into three different sectors: South, Center, and North. Most of the diving points accessible daily from Labuan Bajo are located in the central part of the park. The literal translation of the name means Stone and Hole. This dive site is marked by a small rock with a hole that breaks the surface of the water in the strait between the islands of Tatawa and Komodo. Without a doubt, it is the most famous diving spot in Komodo Center and rightly so. This particular dive site requires that we ALWAYS jump into the water on the protected side of the rock since there can be downward currents on the sides of the pinnacle. When the currents are strong, this dive is not suitable for divers with little experience. It is not unusual to have to cancel dives when the currents are especially strong. On the south side of Batu Bolong we find a deep, almost vertical wall, covered with hard and soft coral. Here we find massive schools of fish swimming around the beautiful topography of this rock in the middle of the blue. Normally, the whole dive is spent slowly zigzagging up one side of Batu Bolong unless the current changes direction during the dive and it’s possible to switch sides. The North side of Batu Bolong is a much more gradual wall; like a hill that gets lost in the depths. Hard coral is predominant in this part of the pinnacle and the biodiversity is just as stunning. Besides the difference in topography and corals, the diving area on the north side of Batu Bolong is larger than the south wall so it’s possible to see more of the rock. It is common to find Napoleons, large turtles, white tipped sharks, giant trivally and sometimes even manta rays all around Batu Bolong. Do not forget to look closely at the coral since the Macro life is very abundant, especially on the South side. 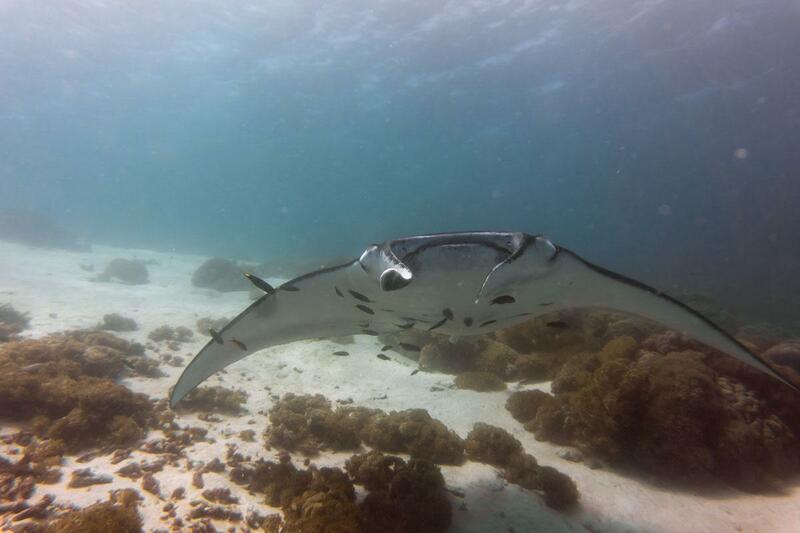 This shallow plateau is famous for the number of manta rays which congregate here. Sometimes you can get lucky and see more than 100 specimens at one time! Because this is a large drift dive site, you will be able to travel the entire coral platform effortlessly. The landscape is very peculiar, it seems taken straight from a Mad Max movie. Coral debris (dead coral pieces) covers this plateau, but is also dotted with small pinnacles of hard and soft coral where aquatic life is concentrated. 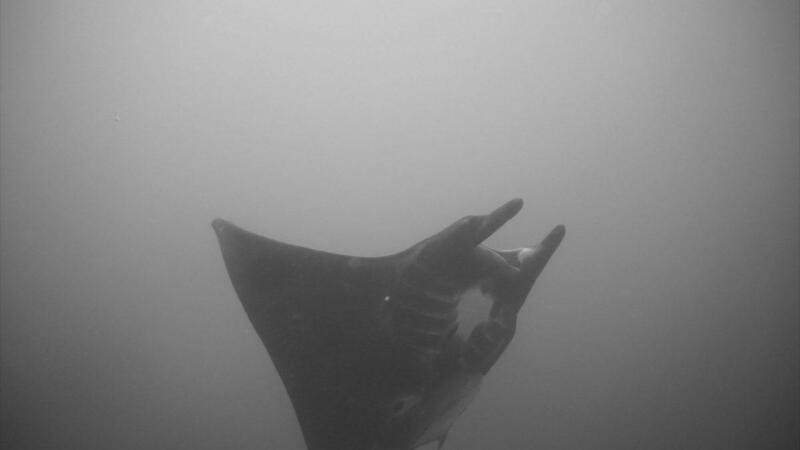 During this dive, you will be letting yourself go by jumping from one cleaning station to another, where the mantas are gathered. Here, the cleaning fish do their job of deworming these large pelagics and you can hang out for the show. This place is perfect for divers of advanced level although depending on the current may be suitable for divers with less experience and good control of their buoyancy. Other inhabitants of this incredible dive site are eagle rays, marble rays, bamboo sharks, white tip and black tip reef sharks, unicorn fish, hawksbill turtle and many more. As a personal recommendation, do not forget to look closely at the coral! Nobody notices the small details when so many big creatures are around, but Manta point is full of spectacular small surprises for macro lovers (just check out the photo above!!!). Mawan is famously known as one of the main dive sites in Komodo where we can find manta rays, both swimming along the reef while feeding, as well as hanging out in the cleaning stations. As a general rule, it is a simple dive, but you have to be careful when approaching a new or full moon since the currents can be very strong. In this case, advanced divers can enjoy an incredible drift dive! 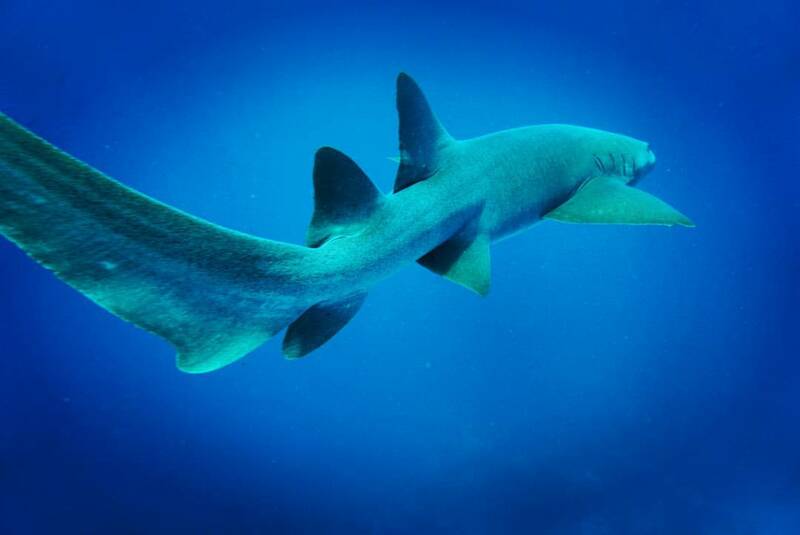 Apart from the reef manta rays and the tropical fish of the area, we can find several types of sharks; white tip, nurse, bamboo and even guitar shark. Keep your eyes peeled for cuttlefish, turtles and especially macro in the small holes of the reef. Normally, we want to dive here in Falling Tide (when the tide goes down). The highest concentration of marine life is located between 8 and 20 meters deep so this is typically a shallow dive. Endless hard coral platforms, orange sponges and small overhangs/caves make this dive an incredible experience. The health of the reef is truly spectacular. Giant Trevally schools, sergeant fish, sweet lips, reef sharks and angel fish are the usual inhabitants. 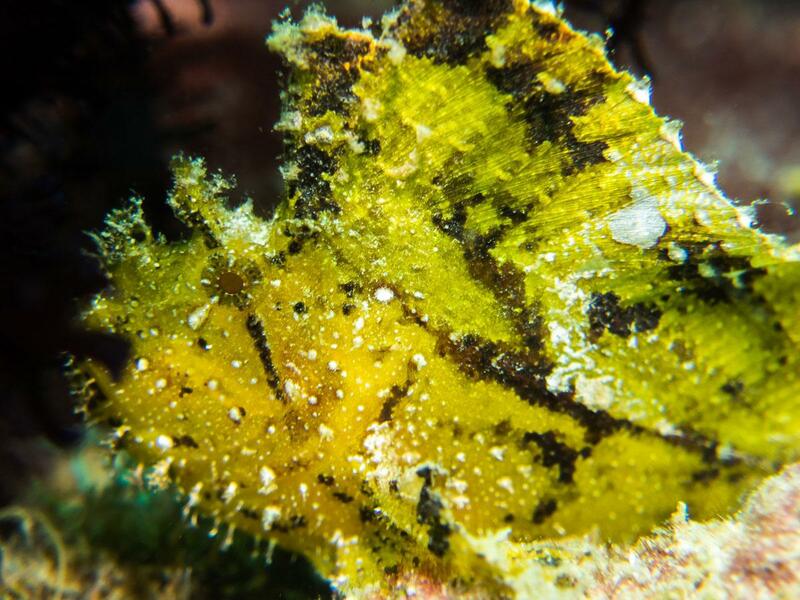 You can even find crocodile fish, octopus, small prawns on whip corals and nudibranchs resting inside the small overhangs. The dive ends in a protected area from the main current. Normally the last part of the dive is spent here relaxing in the coral garden, looking for Mandarin fish, orangutan crabs, hairy lobsters in the barrel sponges (professional secret) and other small creatures. This dive site is one of the most frequented spots in the Komodo National Park because it is not only super beautiful, but it’s also protected from strong currents. The dive starts on the shallow sand bed (10 meters approximate depth) where we can find a lot of nudibranchs, ghost pipefish, frogfish, seahorses and even flamboyant cuttlefish. The second part of the dive is usually spent in one of the areas with the highest population of green turtles in Komodo. 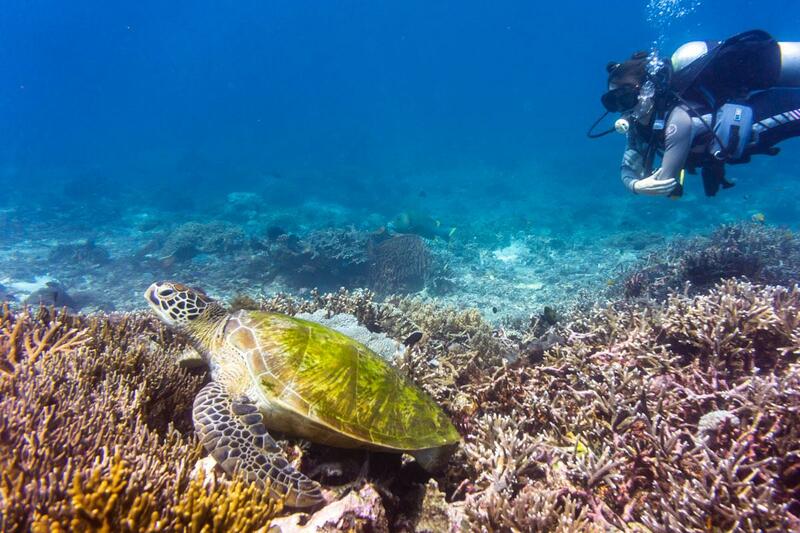 Here we can see up to 20 turtles in a single dive feeding or sleeping on the hard coral. It’s easy to imagine why this place is commonly referred to as Turtle Town! The deepest part of Siaba Besar is a slope of hard coral that goes down to 25 meters depth where the current becomes more noticeable. White tip sharks, sweetlips, unicorn fish, etc, are common inhabitants near or in this channel. This is a simple dive on a sloping hill that descends gently to 25 meters. Spots of soft coral and sand make this point an excellent place for lovers of the most varied macro. 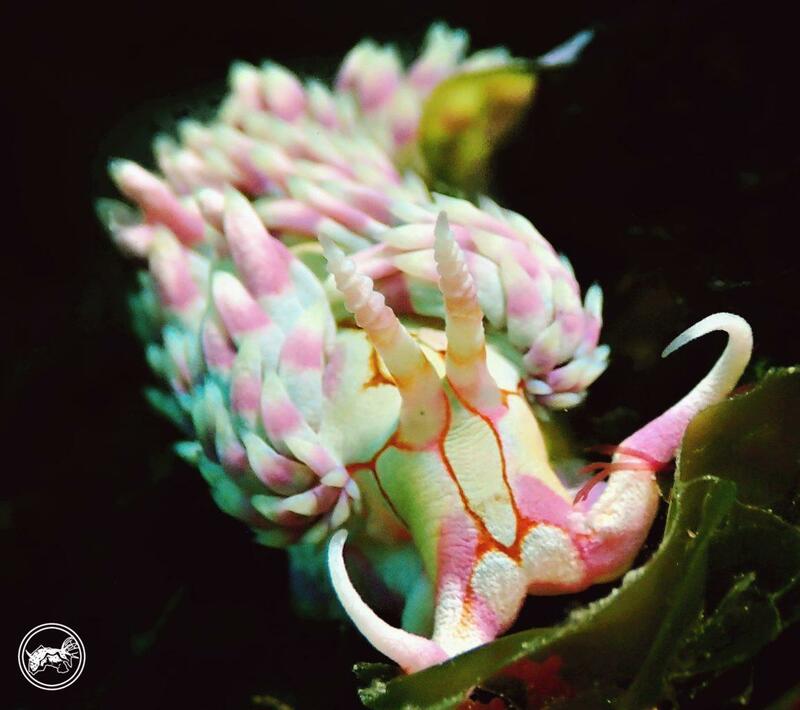 Frogfish, zebra crabs, ribbon eels, nudibranchs of all kinds, including the spectacular Spanish dancer are easy to find during the dive. 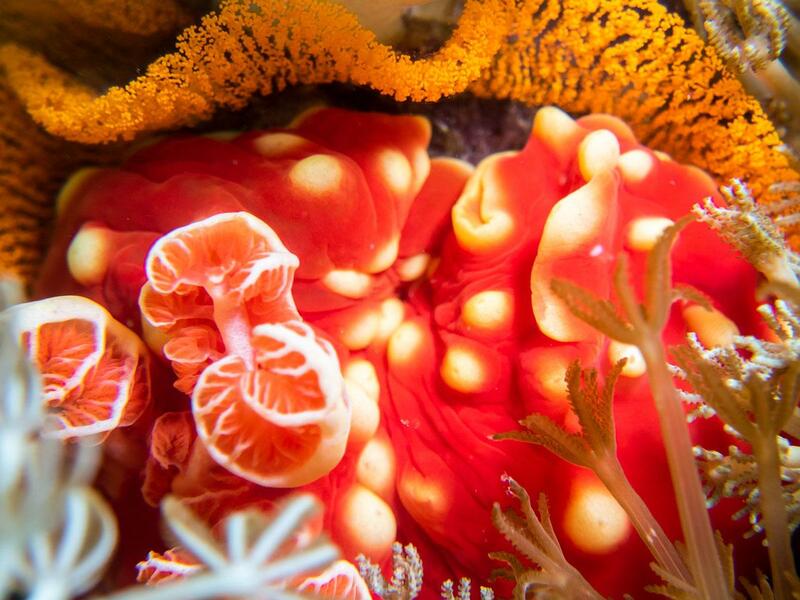 Small seahorses that are camouflaged in soft coral and an incredible variety of exotic decorator crabs and small prawns, make this diving a favorite for lovers of macro and photography. The water conditions are not as ideal here. It is common to have between 5 and 10 meters of visibility as well as slightly cooler water than in the rest of the Komodo diving spots. However, we should know that in order to enjoy macro diving, you do not need good visibility! All we need is a good pair of eyes and an experienced guide. Wearing a magnifying glass is recommended as we can find creatures as small as Pen porcelain crabs or feather star shrimps. This place will leave a lasting impression on you. Specific dive conditions must be present in order to dive it safely. The entry point is on the west side of the Gili Lawa Laut reef and is only possible to dive when the current is moving from West to East or in “Falling.” Typically, we jump about 100 meters from the canal entrance to descend and we let ourselves be carried by the gentle current in the east direction. The average depth is about 20 meters with a sandy bottom and there we can see some white tip sharks and rays. The reef loses depth as we approach the channel and the current begins to gain speed. From there, we approach the part known as The Cauldron. When we reach the shallowest part of the channel, about 14 meters, the cauldron appears before us; a crater with a breadth of 30 meters and 40 meters in diameter. Reef sharks, occasionally manta rays, snappers and giant trevallys are usually seen here. In the northern part of the crater, many schools of snappers, trevally, sweet lips, etc are found in a crack called Fish Bowl. The outlet of The Cauldron is located in the eastern part of the crater, with a depth of about 8 m. The shotgun acts as a concentrated siphon; compressing the current, gaining a lot of strength and speed. Excellent buoyancy control is essential in order to get carried away and leave the Cauldron. Following the shotgun, we drift towards the north reef area where we find an incredible shallow reef called “China Shop.” In this reef, we can find young manta rays feeding, hard and soft coral, as well as loads of macro. Here, we find a large pinnacle submerged far from the coast and lashed by strong currents. This is one of the diving spots in Komodo that you can dive with the tide in both Falling and Rising. The visibility is usually excellent and the shallowest part of the pinnacle (7 meters) is identified directly from the boat. The entrance to the water is made in the area where the current hits the submerged rock (the split). Negative entries are common in this dive site. Normally, we descend to a depth of between 20 to 30 meters to position ourselves in the Split (where the rock cuts the current in two). Schools of fusiliers, bat fish, barracudas as well as white tip and gray sharks await… the current makes it necessary to use reef hooks to enjoy the show that Castle Rock offers. Towards the end of the dive, we drift to the protected area of Castle Rock between Napoleons, jack fish and mackerels. Soft and hard coral give shelter to crocodile fish, scorpion fish and pygmy seahorses. The safety stop is made in the shallow zone, although most of the time it is necessary to use the reef hook again until the 3 minutes pass and we can return to the surface. Just 400 meters from Castle Rock, the shallow end of Crystal Rock gently breaks the surface. Its namesake comes from the crystal clear water around this pinnacle which is like a little brother of Castle Rock. Subject to strong currents, diving is done in a similar way to the previous one. Jump in the current area, a quick descent to reach the split and stay to enjoy the show. The West part has a secondary pinnacle at 14 meters depth. The spot is covered with soft coral and is an excellent place to see eagle rays, tunas, reef sharks, schools of anthias and eastern sweet lips. Towards the end of the dive, we drift back to the protected area to relax in the shallow section and make our safety stop. Find out why the Komodo National Park dive sites are on the list of top dive destinations in the world.